A beautiful adventure platformer with a 16-bit veneer, but with very modern themes. What is it? A lush, story-driven 16-bit Metroidvania platformer. Most of the time, videogames grant us control over supernaturally strong and quick-witted characters who can achieve things we lowly humans would never be capable of. In Owlboy, you take control of an owl called Otus who is an idiot. At least, that’s his reputation in the pleasant owl town of Vellie. Not only is Otus an idiot but he can't talk, so other owls are always giving him a hard time, especially his tutor, who thunders at him for his inadequacies so often that Otus has nightmares about it. Because other owls are mean to him, it’s easy to love Otus immediately. It doesn’t hurt that he lives inside one of the most lushly illustrated pixel-art worlds in recent memory: all bulbous white clouds, blue skies and hypnotic, parallax greens. This locale is being harried by pirates in search of sacred and immensely powerful owl relics which, if held all at once, grant immense and destructive power. Otus is dragged in to help fight them, often inadvertently, along with his cannonball-shooting friend Geddy. During the opening hours, each of Otus’s successes dovetail with a broader failure. In videogame terms, Otus will successfully reach the end of levels and beat a number of bosses, but for the citizens of Vellie and the nearby metropolis of Advent, no crisis is properly averted. The seeming apocalypse rolls on. Each time Otus rebukes his reputation as an idiot—each time he overcomes hazards, puzzles and death—his failure to properly seal the wrath of the pirates is what defines the narrative. He does his bit—and his bit is not insignificant—but he still can’t change anything. He has a few friends helping him, a hodge-podge of various amusing outsiders. Geddy is the first you’ll meet, and Otus is able to warp him into his talons with the press of a button, equipping him with cannonballs to fend off baddies. More sidekicks unlock as you navigate the world, and can be swapped out (or teleported in) instantly. 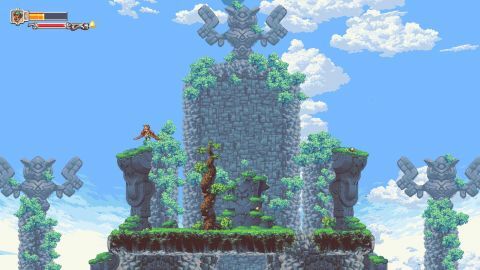 They’re not just for combat, though: they can also be used in the fairly low-stress puzzles that sprinkle Owlboy, and new abilities will unlock new areas in typical Metroidvania style. If platformers need a novel mechanic to tide them over the weeds of so many also-rans, sidekick swapping is it in Owlboy. It’s not a surprising one, but crucially, Owlboy doesn’t need novelty. As far as its raw components go, Owlboy isn’t exceptional. Otus can jump and fly whenever he likes, though he’s a little cumbersome. Swapping between characters mid-battle is easy enough, but when there’s a lot going on, it doesn’t feel precise. During the moments when Owlboy becomes an almost laid-back bullet-hell game, his movement can become annoying. This isn’t a reflex-oriented platformer by any means, and compared to other recent Metroidvanias like Ori and the Blind Forest or Axiom Verge, the character’s fluidity or lack thereof won’t impress, but nor will it grate. To pick it up and play for a moment or two, Owlboy might even seem average, but this game is very much a sum of its parts. Owlboy feels like a cinematic 16-bit platformer, decorated with set pieces the likes of which you might find peppered throughout modern blockbusters. It’s story driven, and I’ll be the first to admit that I generally dislike story-driven platformers, but the writing is strangely resonant in its exploration of hope and futility, while the dialogue is equal parts amusing and full of not-too-saccharine pathos. The common storytelling pattern of profundity offset by a tension alleviating joke doesn’t (always) apply here. Owlboy doesn’t trade in carefully orchestrated moments which reveal, with a sledgehammer, what the game means. It spreads its hints thinly, allows you a moment to reflect, and then has you smiting blobs mid-air with an endless supply of cannons again. The balance is marvelously handled. Owlboy’s sidescrolling dungeons are exciting in the way Zelda’s dungeons are. No one’s likely to be stumped, though you’ll struggle just long enough to feel satisfied when a particular puzzle or boss encounter is finally cleared. It’s a breezy game if you’re familiar with the genre: it doesn’t wield difficulty as a marketable selling point. It’s not performative, it’s not about skill, and it’d probably be boring to speedrun (though given its profile already, that scene will no doubt embrace it). More than anything, Owlboy is about watching an owl kingdom try to sort itself out. It’s impossible to discuss the best virtues of Owlboy without basically providing a synopsis. While it may fall short of the ambiguous pathos of something like Fez, it’ll likely be a game many people will feel sentimental about—and not just because it’s jacketed in the nostalgia of the 16-bit era. Owlboy feels painstakingly, lovingly crafted, moving away from systems-oriented indie platformers to something that moves from point A to B and beyond with surprising new twists, turns and mechanics for each plot beat. During a holiday season of bleak, warmongering escapism, Owlboy is a welcome salve.